They've actually got over 3,000 bloggers signed up. Each s writing a post about one of the victims of that day 5 years ago. The list is here. What a great idea and I only wish I had heard of it in time to participate. That's a powerful use for the thousands of blogs out there, most (like this one) of little consequence. Thanks to Bill (De) at The Thinklings for the link. I can remember growing up my parents and those in their generation telling us how they all knew right where they were when they heard that President Kennedy was shot. They all would recount with detail where they were at that time. 9/11 is like that for me and my generation, it's as if we were right there. I remember, at my job we had a meeting each morning to review the day's activities. 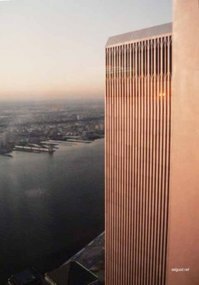 In that meeting on 9/11, it must have been at 9:00 AM, one of the guys in the shop had heard fro his wife that some idiot in a Cessna had flown his plane into the World trade Center. We laughed at how stupid that was. It wasn't long, as the details became known, that we stopped laughing. It wasn't stupid at all. It was coldly smart, cunning, calculated and evil. We tried to get some work done. Instead, with no TV in the office, we kept hitting refresh on CNN.com and listened to NPR news, trying to see and hear the latest. I remember CNN.com and other sites having streamlined front pages to load faster to handle more traffic. I remember the plane hitting the Pentagon and wondering, dear God, what was happening. I thought of a possible World War III, my family at home, what would be next. I was genuinely scared by the prospects. I remember being in line at Big Bear grocery store, buying M&M's when the first tower fell. We had a project for a bulk food bin manufacturer to design a dispenser for M&M's and we had eaten all our test samples and needed more. As I stood there buying several pounds of M&M's I watched the TV set up in the isle as Tower 1 fell. The M&M's didn't seem to matter much. After work, I remember being glued to a Aaron Brown on CNN who's calm, personal, conversational delivery was both odd and somehow reassuring. I think he had just started on CNN the day before or something. I stayed up half the night, like a train wreck, I couldn't look away. I think I did the same for several nights in a row. I have other memories of the World trade center on this anniversary day. 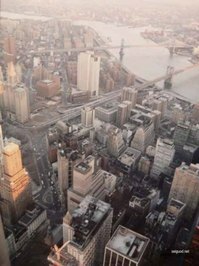 Over 10 years before 9/11, I lived in NYC on an internship during my college senior year. These pictures, digipics of 35mm prints, are from that time. The first is a scrawny, single me (with some strange fuzzy stuff growing on top of my head) and a sister named Amy, on a date. I don't remember Amy's last name, and the picture just says Amy. I guess I thought I'd remember her forever. It was taken on Ellis Island, looking back at Manhattan. I had forgotten how the WTC dominated the skyline. The second, I believe, is from later on that same date, up on the top of the WTC, looking down on the city. That's the East river and the Brooklyn Bridge in the background and those are 30, 40 , 50 story buildings in the foreground. Being up there was amazing. I could have spent hours looking down and examining the buildings and streets. The last is the view of the second tower from the first, in the glow of a mid-winter sunset. We stayed up there through sunset that evening and it was phenomenal. We watched the lights come on and the city grow dark. I went up again, later that winter of 1991, when Mom and Dad came to pick me up after my job was done. Nearly 11 years, later, just weeks after 9/11, Mom and Dad flew to NYC for the Macy's thanksgiving day parade. Mom was dancing in it. They visited ground zero, still smoking. There were armed guards preventing picture taking, out of respect I guess. Dad had to break the nail file off of his nail trimmers before getting on the plane. The nail file, on a little pivot, would be near useless as a weapon, but then again, who ever thought a box cutter was a formidable weapon before 9/11. After coming home, Dad remarked how strange it was to look up in the empty sky and think, I stood up there once. Way up there, in the now empty air and clear blue sky, high above all the other structures, he, Mom and I once stood. Now there was nothing to stand on. Your picture from Ellis Island reminds me of the engagement pictures I took of a couple of friends from this park along the Hudson in Jersey City with the WTC as a backdrop. I asked Laura to Go Steady (TM) with me in Windows On The World, the restaurant at the top of the WTC. She said Yes, then said Yes again a year later when I asked her to marry me. We were always going to go back again for fun. I think now, it might be just as special, if not more so, to go to whatever they end up building there. We used to like going up to the observation room and deck after church whenever we met in Manhattan (first at Town Hall, then the Beacon Theater, then the Javits Center). Your second and third pictures remind of of those times. I remember hearing my boss come out of his office and say, "Hey...a plane just flew into the World Trade Center." And to be honest, I hadn't really known that what I knew as the Twin Towers were really called the World Trade Center. Don't ask me why...but I just never knew it. We went to the nearest tv and turned it on. Within about 2 minutes, every tv in the building was on, including one in the Audio/Visual room that was basically a 6 foot screen that had a tv image blasted onto it. None of us went back to our desks. We simply watched in horror as the events unfolded. It seemed so surreal. And when the towers fell, it just felt like I was watching everything in slow motion. I remember thinking to myself that my own struggles were so insignificant compared to the enormity of what was happening. I found it humbling. I remember hearing about some Americans who pounded the tar out of an Islamic man, and having mixed emotions about it. It is strange how emotions can be brought back to the surface with such clarity, even if some of the details of the event are lost. Another manager in my office got a call from her mother saying a plane had hit the WTC - but it appeared to be a small plane. I got CNN updates via email and started to get more info. Soon, it was evident that things were very bad. We didn't have a TV in the office so our VP had someone go and buy one of those portable TVs to bring in. She set it out and we just walked by and tried to make sense of it all. I wasn't 'scared' until it was apparent that there was more than the WTC being targeted. You were just frozen. The next couple of days all the churches had opened for people to come and pray during special services. I went with my co-worker to her Baptist church during lunch for a prayer service and my husband 'happened' to come to the same church for the service - even during big tragedies, God works to bring small miracles. I'm old enough to remember where I was when Kennedy was shot (we lived just blocks from the Texas Theater in Dallas). I was too young to understand the meaning of what happened then or to be unsettled/afraid. 9/11 brought to us the fear and the reality of bad things happening on our own soil -somthing that most of the world has faced,in one form or another, for many years. Mark - I wish that picture of a picture came out better. The towers aren't as clear here as they are in my snapshot. Were you in NYC in 1991? I was there in the Harlem ministry from Jan. - Mar. with the Leonard's. It was called 'Harlem', but I lived on the upper east side near 83rd. & Lexington. It wasn't a high point for me spiritually, but a memorable time. I have to say, most of my dealings there were with church folk, and I wasn't that observant back then, so I didn't form an opinion of New Yorker's. I remember one guy who came around while I was there. Thick Brooklyn (I think) accent. He was Cuban, at least in background, and he used to take us for 'rice and bullets' at a Cuban place on Broadway. Good stuff and he was a great guy with a big heart as I recall. I also remember, a couple years later, having to contact folks for work who were in NYC. It seemed like I was really interrupting something, and I was calling to buy their product. Geez, sorry to bug ya was my thought. Interesting to think that this 'harsh' exterior has nothing to do with the heart inside. 9/11 certainly showed that. I think Jesus said something about judging by appearances too. We were there - Laura became a Christian in 1986 and I moved there in 1987. Laura couldn't make out enough of the face in your picture to figure out who that is with you. We have no idea what became of the Leonards. I think they were in either Westchester or Connecticut the last time we saw them, and that had to be at least 5 years ago. But they do have lots of great international food. One of the funnier things in NYC is the existence of these "Spanish Chinese" restaurants. There are quite a few in uptown Manhattan. It always makes me want to ask for "Beans and Fried Rice." There are a significant number of ethnically Chinese but socially Latin folks whose ancestors had immigrated to the Caribbean. At that time, they (the church folk responsible for the names and such) called everything in northern Manhattan 'Harlem'. They said that was technically correct, but it could have been the old fashioed ICOC this is what we want it to be, so it is. For a midwesterner who has a picture, right or wrong, of what Harlem is, you're right, where I was is not that Harlem. I was out of work (victim of the dot com bust) That morning I was busy at home looking on job boards etc. I had a half day consulting job that afternoon, so I came upstairs just before noon and turned on the radio (to entertain our parrot) before I left. The first thing I heard was "America Under Attack". So I turned on TV and saw the replay of the planes crashing into the buildings and got a brief update on what had happened. I went in to the consulting job and did what I was paid to do (I neeeded the money!) I think I was the only person in the building who was working that day. Totally surreal. I was at a ladies' missionary fellowship meeting the morning of 9/11. We were at tables praying for different areas of the world when we heard. My clearest memory is of a woman who must have been in her 70s who got a faraway look of terror in her eyes and started talking about "still remembering the gold stars in peoples' windows." I believe she was referring to signs put in the windows of homes that had a soldier fighting in wars. It was begun in WWI with blue stars for those fighting and gold stars for those killed in the war. I don't know if she personally lost someone, but I can still see that look on her face. Before that day I didn't think I would ever "know" someone fighting, being wounded, or having been killed in war. Now I do. That day, I was glad I was there with those sisters in the Lord praying. A few days later we drove by the Anheuser Busch plant in our city that has two buildings that are tall and rectangular. My 3 year old asked if those were the buildings that fell. Even little ones supposedly shielded from seeing and hearing the news and images knew something terribly wrong had happened that day.